In a small saucepan over medium-high heat, combine the butter and powdered milk. Cook, stirring frequently, until lightly browned and nutty in fragrance. Remove from the heat and allow to cool and solidify. Meanwhile, make the filling. In a small saucepan over medium heat, combine the figs, orange juice and water. Cook, stirring regularly, until the figs are broken down and very soft, about 15 minutes. Transfer to a food processor and processor until smooth. Transfer to a bowl and allow to cool completely. When the butter mixture is ready, in a medium bowl combine it with the sugar and salt. Use an electric mixer to beat until creamy and well combined. Stir in the flour until a thick dough comes together. 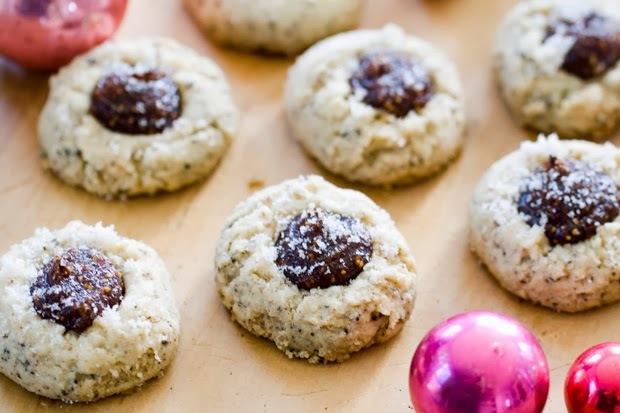 To shape and fill the cookies, pinch off a tablespoon of dough. Roll the dough into a ball, then press your thumb into the centre to make an indentation. Fill the centre with 2 teaspoons of the fig mixture, then arrange on the prepared baking sheet. Sprinkle the tops of the cookies with vanilla sugar. Bake for 20 to 25 minutes, or until golden brown.